For simple harmonic motion, I like to split the introduction into two labs. The first is qualitative and focuses on graphical relationships. The second quantitative and focuses on the mathematical models for those graphical relationships. Today, we started the Oscillating Particle Model (OPM) with the first lab. I have three types of simple harmonic oscillators: a horizontal spring oscillator, a vertical spring oscillator, and a pendulum. 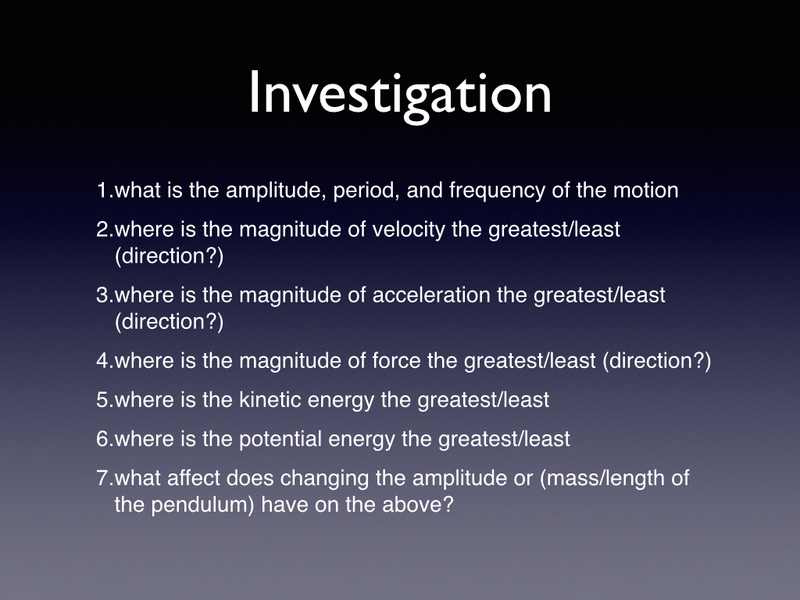 I assign two groups to each type and have them answer the following questions and investigate how changing either the mass or amplitude (for springs) or mass or length (for pendulums) affects their answers. We started to share our results on whiteboards. The chain of reasoning and discussion that resulted was fantastic. One group led the class through the thought process that the maximum potential energy of the system doesn’t change when the mass of the horizontal oscillator is changed while the amplitude is constant. From that they jumped to the conclusion that the maximum kinetic energy of the system must also not change. Then, on-the-fly, they reversed their original statement based on limited data that increasing the mass of the oscillator decreased the velocity in a linear fashion. Now analyzing the system from an energy perspective, they realized that as the mass increase the square of the velocity must decrease. Great stuff! Previous Previous post: Day 120: Science Olympiad T-Shirts! Next Next post: Day 122: Java Programming Champions!